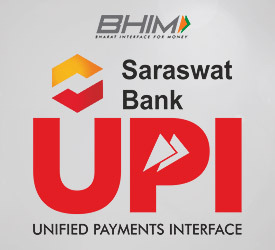 Bharat Interface for Money (BHIM) is a mobile application that lets you make simple, easy and quick payment transactions using Unified Payments Interface (UPI) with Saraswat Bank. You can easily make bank to bank payments instantly and collect money using Mobile Number or Virtual Payment address. It can be used on Android & iOS mobile handsets. BHIM refers to Bharat Interface for Money. How fast is a transaction over BHIM app? Instant transfer. All payments over BHIM app are linked to your Saraswat bank account and transaction can be completed within few seconds. There are any charges for using BHIM app? No, BHIM app is completely free. However, downloading BHIM app from app store may charge you for utilization of internet data pack. Is BHIM app available on all the Mobile Operating System (OS)? Currently, BHIM app is available for Android and iOS mobiles. How to begin with BHIM app? You need a smartphone with an active internet data pack. Also, it is mandatory that you should register your mobile number linked to your accounts with Saraswat Bank. To use BHIM app, do I need to register for Saraswat Bank Mobile Banking? No, it is not necessary to register for Mobile Banking facility with Saraswat Bank. Your mobile number should be registered with Saraswat Bank. Do I need to be a customer of a Saraswat Bank to use BHIM? Yes, it is necessary that to use Saraswat Bank UPI services, you should be a customer of Saraswat Bank & your mobile number should be registered with Saraswat Bank to use the facilities of UPI platform on BHIM app. How do I set the UPIN for my bank account from BHIM? You can set your UPIN by going to Main Menu > Bank Accounts > Set UPIN for the selected account. You will be prompted to enter the last 6 digits of your Debit/ATM card along with the expiry date. Further, you will receive an OTP on your registered mobile number which you have to enter and set your UPIN. Note: UPIN is not the same as MPIN provided by your bank for mobile banking. UPIN (UPI Personal Identification Number) is a 4-digit code which you have to set during first time registration. While initiating a transaction, you have to enter UPIN to authenticate the same. Is there any difference between UPIN & MPIN? Yes, your UPIN is to authenticate the transaction in BHIM app, whereas your MPIN is used to login into Saraswat Mobile Banking application. Can I use my Saraswat Mobile Banking MPIN for BHIM app? No, MPIN is strictly used to login into Saraswat Mobile banking app only. To login into BHIM app, you need to set your UPIN separately. Is there any precaution I have to take for using my UPIN? Yes, do not ever share your UPIN with anyone and keep it confidential. Saraswat Bank never ask for your any PIN & login related information. Currently, BHIM supports linking of one Bank at a time. At the time of account set-up, you can link your preferred bank account as the default account. Several bank accounts can be linked to the same virtual address. In case you want to link another bank account, you can go to Main menu, choose Bank Accounts and select your default account. Any money that is transferred to you using your mobile number or payment address will be credited into your default account. My mobile number with BHIM and the one registered with Saraswat bank account must be the same? Yes, it is mandatory that your mobile number linked to your account should be registered with Saraswat bank to use the facility of BHIM app. Is it necessary to provide my Saraswat Bank account details to BHIM app while registration process? At the time of registration, you need to provide the Debit card details & your registered mobile number with Saraswat Bank. The app will automatically fetch your linked accounts from Saraswat Bank. Every transaction initiated from your Saraswat Bank account will be listed in the BHIM app. You can view all your past transactions in the 'Transaction History' section on the BHIM App. What is the transaction limit on BHIM app? Rs. 10000/- limit per transaction subject to Rs. 20000/- per account per day. Ensure you have sufficient network connectivity. If you have entered your Payment Address at the merchant app, please re-check your Payment Address and re-try the transaction. Please check your pending transactions tab to check if the collect request has reached you. How to raise complain on BHIM application? On Home Page, choose Transaction option, select the declined transactions (highlighted in Red) & click on report issue or call bank. Customer’s mobile number is registered with the Bank, still he/ she is not able to use the BHIM application? If Customer’s mobile number is registered for some other customer number including his relatives or otherwise, then such customer may not be able to use the BHIM application since UPI works on the principle of single mobile number for single Customer.